Guru Purnima, which falls on 19th July 2016, is the most auspicious day of the year; as it comes only once in a year. This day is filled with Happiness & Positive Vibes. 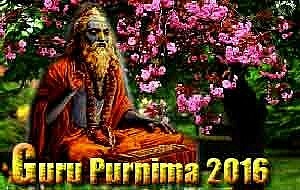 Guru Purnima is the day devoted to our Guru/Teacher. So you must take the blessings from your Guru on this day. You should necessarily attain diksha/sadhana/puja from your Guru this day as it's effect get maximised by 10X times..
You can visit any temple with your family and worship the god. One must always think of positive things, happiness even of their enemies if any & should pray to god for success, fortune, good health & prosperity. 1. On this day, visit nearby Lakshmi Temple and put a paper written with "REEM" 11 times on feet of mata Lakshmi for fulfilment of wishes. 2. Chant "om reem shree mahalakshmeya namaha" for success in wealth. 3. Chant "om kleem kleem paatu shreem raksha kuru kuru shreem namaha" for debt problems. Chant these above mantra's 324 times (3 MALA).